Exploding Doughnut: Ready for it to be over with! I used to enjoy this time of year. Christmas was my favorite holiday. Working in BUSY retail has changed that. Not all, but a lot of the customers at the arts-and-crafts store I work at are very demanding and needy and at times downright rude. Maybe it's because they're city shoppers instead of slower-paced suburban-folk but there's this sense that I'm paid to help them therefore they don't need to be appreciative when being helped. Add to the fact that the job is already stressful and tiring and has me working on or around actual holidays, well, it's not fun and it kills the festive mood. Now putting up the Christmas tree at home becomes one more thing to do. The decorations another chore. But on a happy note, let me show you what fellow blogger, Randy, made for me. Currently hanging on the family Christmas tree! 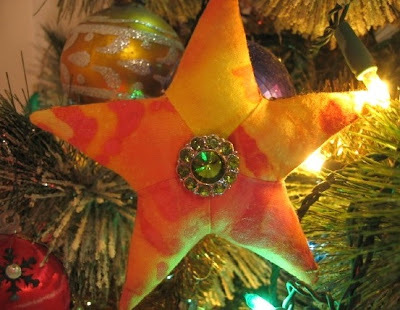 Continuing his handmade ornaments for friends and family, Randy sent me this starfish. Made with colorful fabric, stitched with care, and topped off with a twinkling jewel. Love it! It'll be a wonderful companion for the seahorse ornament he made for me last year and a reminder that there's still some good left. That December has many facets. Some better than others. Perhaps deep down there's a part of me that still loves the Christmas season but I'm sooooo ready for it to be over with! Love the ornament. I dread this time of year with all of the fake people and the consumerism. Merry Christmas, Anyway! Hope your holidays are fantastic in spite of your job. What store do you work at, if you don't mind me asking? That's another beautiful ornament from Randy. It's too bad all the stress ruins the season for you. Hopefully, corporate will close the store on Christmas, and you'll have a chance to relax for a while. Ah, the story of Christmas. Can't wait for it get here. Can't wait for it to be over! I worked at Macy's NY one Christmas a while back. It was Hell! I didn't once experience the holiday spirit. But, I LOVE that starfish. Let's just focus on that. Hope you can find a little time on Christmas to relax and reenergize! I don't name the arts-and-crafts store for privacy reasons but I also don't want one of my supervisors or higher-ups to find me badmouthing the store! We are closed on Christmas Day. Thank God! You are luckier than you realize. Try to take some time to enjoy yourself during the holidays; you deserve it -- Merry Christmas, Dean! Love the ornament and I hope that dispite the job your day was filled with love and laughter. I do agree with you on that, Ian. Sometimes when one is in the thick of things, they don't always realize what they DO have in life. I don't know that it was filled with love and laughter but my Christmas Day was filled with great food and family! Then you know exactly what it's like. Hopefully next year we'll both get to enjoy the Christmas season! It really is a beautiful ornament. Some part of me thinks it would be great to make all our own ornaments some year. Then again. I may end up some demanding customer at a Michael's somewhere. So maybe not so much. The crafts store would love to have you no matter how demanding you may be! I stopped decorating at Christmas when a cat chewed through the light wires of the pre-lit tree. The year before she chewed through the strands of Christmas lights, plus she loved the sound of breaking ornaments. She was one of the two cats who passed away last summer. I miss her more than I have missed Christmas trees. It sounds like she loved Christmas in her own way too!